Mount Olympus, Greece's highest mountain is located in northern Greece comprising the natural boundary between the prefectures of Macedonia and Thessaly. Mount Olympus' highest point is the summit of Mytikas. Rising to an elevation of 2918m, Mytikas is spaced a mere 18km from the adjacent coastline on the eastern side of the mountain. Due to its proximity to the coastline, and the rough relief characterizing the it's western side Mount Olympus has proved a difficult crossing point for numerous aspiring conquerors of the Greek territory since the ancient times. Unlike Pindos range on the west which is the natural extension of central Europe's alpine Orogeny, Mount Olympus massif comprises an independent massif, geologically connected to the Pilion and Kissavos mountains. 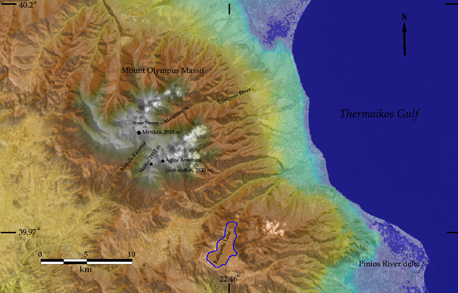 Mount Olympus is a circular massif with an average diameter of 25km, while its perimeter is in the order of 80km. Access to Mount Olympus is provided either by car, by train and by public bus. The town of Litochoro comprises the eastern gate of Mount Olympus and through the Aegean motorway is spaced 90km from the city of Thessaloniki and 420km from Athens, where the biggest airports of Greece are located. Regular train (www.ose.gr) and but (www.ktel.gr) transport link Litochoro and Kokkinopilos (the western gate of Mount Olympus located close to the city of Elassona) to many popular destinations (Athens, Thessaloniki, Meteora, Delphi, etc). 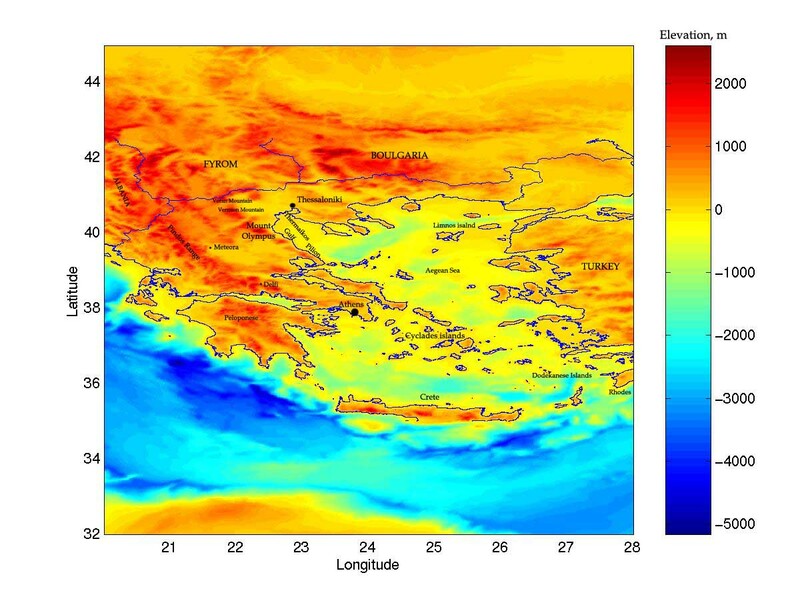 Geographical map of Greece produced by the processing of GTOPO30 data. 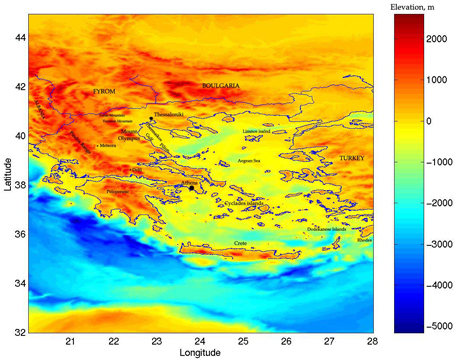 Mount Olympus general topography derived from SRTM 90 topographical data.